$11.00 In stock. Order in the next 11 hours, 39 minutes and it will go out today! The classic gag with a magic wand! It's a guaranteed moment of laughter and surprise. Catch your volunteer by surprise (to everyone's amusement) when you hand them your magic wand and it magically breaks apart in their hands! Or turn the laughter on yourself when the wand collapses in your own hands. 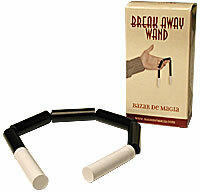 At AmazeKids, this is our favorite version of this classic gag with a wand. It's heavy plastic and is 13.75 inches long. It comes with a removable piece. When that's slipped out, the wand collapses. Insert it, and you can hold the wand in any position and it will remain straight.